ruruzest replied to Alex_Trusova's topic in Community Talk: Tickets, Meetups, etc. I’m too distressed to notice that!and now I just read that Yuzu may not go to ACi because it’s too early in the season! I really want to attend a big event such as GPF or World because so far I’ve seen Yuzu both times at ACi. It was a wonderful experience that I’ll treasure forever. Therefore I bought GPF tickets when they first released last year but it was a sad event without Yuzu!. I was hoping for World next year but the ticket price is ridiculous. With my poor eyesight I need Premium tickets which I can’t afford. . 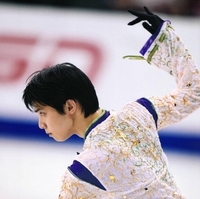 I don’t want to buy cheap seat just to see shape, form and shadow of Yuzu! What to do! It’s very interesting to read all your above comments about Yuzu’s GOAT status! Yuzu has reached his position through his genuine love for the sport. He mentioned in one of the interview that he thinks about skating ALL the time; he shows his joy when he’s on ice ( which we don’t see in lots of others). He said “ I want to skate” and did a spiral while filming the Magnificient. He gave the ice an incredible kiss in Haru yo Koi. That love combines with his hard working and idealistic personality has created so many memorable performances that move the audience to tears and touched the hearts and souls of fans deeply! Who can do this? When he broke the record of 300, he did it with a large margin, over 20 points then did it again 2 weeks later with more than 10 points! He’s extra that way! To the fans he is THE ABSOLUTE CHAMPION and THE GOAT! is it me or Yuzu has a bruise on his face? He knows us so well!